Submitted by Stratovarius on 2014-07-18 09:54. A new version of the Character Creator updated by xorbaxian. It fixes the annoying bug with some windows not showing all the buttons. We have updated the Character Creator to coincide with our 3.2 release. It now comes with an executable file that will make operation even easier. Users can now hear the voicesets when selecting them! 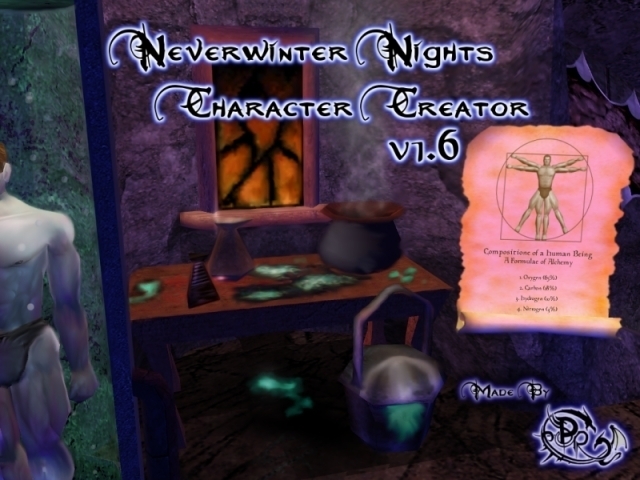 Allows you to customize your character with over 50 races, 11 new base classes, and more than 200 new feats when used with the PRC Using a custom hak, and your standard NWN data files, it reads, parses, and allows different characters depending on your entries, similar to the regular character creator within NWN. This program, however, allows much greater customization, and also allows many options not available in the regular in-game creation tool. Custom races, spells, feats, familiars, companions, soundsets, NPC portraits, NPC soundsets, NPC appearances, and more are all available with this tool. Make your tattoos visible on only your left forearm. Make your character a golden color, or completely black. All this is easily done with this program. Based off of the CODI Character Creator program. Windows: Download the Windows file, extract it to a folder, and double click the CharacterCreator.exe file. Linux/Mac: Download the appropriate file, extract, and run the CC.jar using "java -Xmx300m -jar CC.jar" on the command line from the appropriate folder. In order to use the character creator you need to run it then open the settings and click the plus button beside the Hak Files box, then add the following files; prc_2das.hak, prc_textures.hak, and prc_race.hak. You will then need to select the "Use Custom TLK" option and add the prc_consortium.tlk file. "Use Default TLK" should remain selected. It may be necessary to create a folder called "Portraits" in the base install location for NWN and fill it with any portraits that you want to use i.e. portrait packs that can be found on this site. After all of that you can use the creator to create characters of the various races and classes that the PRC adds, it will automatically add racial feats and set the racial appearance in the game to an appearance that matches your race. Is there a character creator that doesn't use the PRC? I prefer not to. You have LETO and you can make characters in-game, edit them with trainer modules (appearence including) and various mods. Non of those require PRC. I'm having a problem choosing finalize in the character creator. I've tried many different classes and skills and am using the recommended button. I've also tried on two different computers. Any ideas? I have taken a screen shot: I get to the customization screen and it looks a little odd. I click around and can't proceed to finalize since it's greyed out. Have you got PRC installed? I am having issues using the CC with PRC. Can anyone help me solve this? I just downlaoded the CC 1.8 for Windows. It's not working for me. I have NWN Diamond\1.69 repatch\1.7.1 Community, CEP 2.6.1 and PRC 3.5. I have added the below. This allows me to create a character to the feats. Then i get an errror leaving the feats. Hello. I am having trouble using PRC CC Windows version. I am running it on Windows 8.1 (More precisely, running windows 8.1 on Macintosh by using Parallels Desktop) and my NWN is from NWN Complete. The CC runs, and I can proceed to just before "finalize". But whenever I tries to finalize and save my character, the CC says to try again. Would somebody please *help me? I followed the instructions Malpheor posted and tried to make a warlock. Everything went fine until I clicked "finalize", at which point the program froze and eventually showed nothing but a black screen. I had to close it via Task Manager, and it doesn't look like the character I made was saved. Any advice? do u have to put the files in the nwn 1 main folder? i did that and started the exe but nothing happens? Hi! I remember there was a module updater which allows me to install PRC and CEP 2.X into a module simultaneously. Where can I get it? I have installed this on a windows 8.1 platform and cannot get it to load. I have tried capatability mode, and run as admin. I even moved the files into my main nwn folder. I used to be able to use the character creator before my system crashed and I had to rework everything. Any suggestions would be helpful. Is there any way to get non static character models for the different races you know, showing armor on/off, wearing a helmet...etc? Illithids just wear a robe and you can never take it off as with all the other races unles they have disquise. The dynamic head slot, body slot on customize character are opaque and you cant choose them...are there some haks I a missing to activate them or is this how its gonna have to work? Other than that I love it, I spent three days just creating different characters not even playing. For some reason I can't use this to create characters with classes added by the the PRC anymore - it just loads endlessly when hitting the "finalize" button. Races are unaffected.